Josiah Antoine, alias ‘Red Ants’, has been sentenced to six months in prison for snatching a mobile telephone from a non-national, the office of Castries Mayor, Peterson Francis has announced. A release from the Mayor’s office said Antoine was also fined $500 for possession of a dangerous weapon when he appeared in court at Gros Islet on Wednesday. ‘Red Ants’ was pursued by public spirited citizens last week Tuesday after shouts that he had stolen the visitor’s mobile telephone in the William Peter Boulevard. 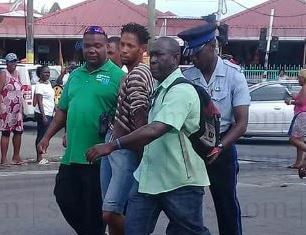 Police officers on patrol eventually apprehended him near the Castries Market. The accused was subsequently charged by the City Police and taken before the court, where he was remanded until April 10. The stolen mobile telephone was recovered. Castries Mayor Peterson Francis was quoted in a release from his office as praising the City Police for the big role they played in getting the accused convicted. Gd Job but the mayor need to stop trying to divide the ppl. U leave Gros islet town to come Castries and pull dong hit ,you see what stealing doing ,that’s not ur first time smh. @Sue Sear…you are totally obsessed with the security guards’ wages and working conditions! How stupid are you? It is a job that does not require much skill or training. What do you expect? You need to let it go ! If the RSLFP made a press release for every single “arrest” they made they would look good as well. It should have been 6 years. This is a very good idea. His punishment should have included hard work. This ant also needs some licks in the anthole. I say 10 years in jail tourist are still coming to saint Lucia he won’t be around to try it again.thoes are the ones spoiling the country’s name and shaming people. just fly his hand and finish with that.